CHICAGO -- Kyle Korver returned to Chicago in a blaze of glory on Saturday night, drilling seven 3-pointers to lead the Atlanta Hawks to a convincing 107-99 victory over his former team at the United Center. The 6-foot-7 Korver, a former Bull, went 7-for-9 from long distance and 7-for-10 overall for 24 points as the Hawks won their 12th straight, tying a franchise record. With a 33-8 record, Atlanta separated itself from the rest of the Eastern Conference and now leads second-place Washington Wizards (28-13) by five games. 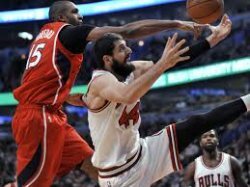 The Bulls stumbled off to yet another slow start, trailing early before closing the opening quarter with a 24-16 deficit. It's a source of disappointment for Derrick Rose, who fell two rebounds short of a triple-double with 23 points, 10 assists and eight boards. "There were lapses. It seemed like we were down and chasing them the entire game. I don't know when we are going to learn but we have to learn quickly," the former MVP told reporters after the Bulls lost for the fifth time in seven games, their record falling to 27-15. The Hawks showed incredible offensive balance, scoring 34 points in the paint while cashing in 33 points off 11 3-pointers made. Al Horford finished with 22 points and nine rebounds for Atlanta while Jeff Tague had 17 points and 11 dimes. Paul Millsap added 16 markers for the Hawks, who made 40 of 87 shots and merrily passed the ball around for 31 assists. The Bulls shot fairly well, 37 of 80 from the field, but they went just 9-of-26 form long distance and had only 25 assists against 13 turnovers. Pau Gasol had 22 points and 15 rebounds and Jimmy Butler pitched in 15. Aaron Brooks contributed 13 markers off the bench. Photo: Hawks center (L) stymies Bulls' rookie Nikola Mirotic in Saturday night's action at the United Center. Atlanta handled Chicago, 107-99.